Chicken salad sandwiches are a childhood favorite for many, and just because you may be making an effort to eat healthier does not mean you have to give them up. By substituting fat free Greek yogurt for calorie laden mayonnaise you are making significant reductions on both calories from fat as well as overall calories. I prefer Fage brand Greek yogurt and find it is rich and creamy and is a great substitute for sour cream or mayonnaise in many of my recipes. We have a basket of cherry tomatoes ripening in our garden on a daily basis right now so I added them into my salad for added flavor and color. You could also skip the mustard, and replace the tomatoes with grapes if you prefer. Substituting Greek yogurt for the mayonnaise significantly lightens the fat and calories in these wraps. 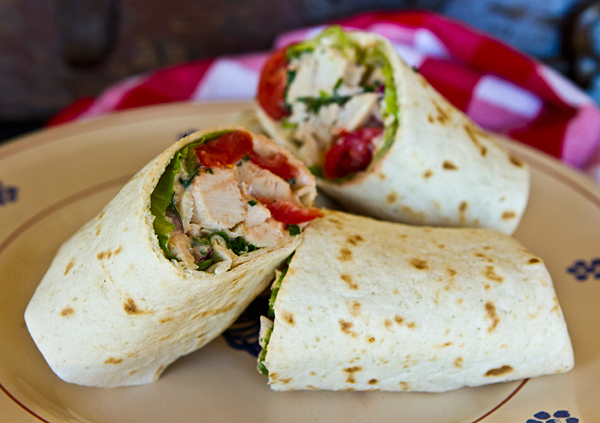 Whole grain, whole wheat or low carb wraps add nutritional value. Chicken breast meat is much leaner than thigh or leg meat. In a bowl, mix together the chicken, celery, tomatoes, yogurt, mustard, mayonnaise, onion, salt and pepper. 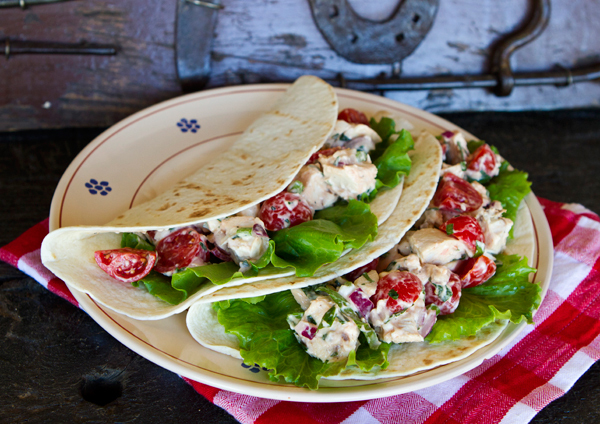 Lay the lettuce on top of each wrap, and divide the chicken salad evenly amongst each. Tuck in two sides of the wrap, then carefully roll, tucking the seam side down. Refrigerate for 30 minutes to an hour, then cut each wrap in half and serve on individual plates.